Please Note: Bookings of 10 people or more will be contacted in advance with our Group T&C's which include prepayment 4 weeks prior to arrival. Should your group not fit into our criteria, please do call or email and check our availabilty as we can be flexible. Obtém a nossa aprovação por receber constantemente bons comentários dos hóspedes. 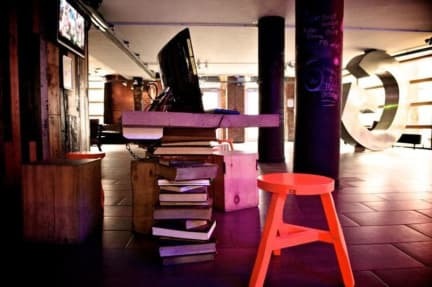 Este texto foi traduzido usando O recém-inaugurado Generator Hostel Dublin é um 'hostel muito elegante ", que os nossos comentadores freqüentemente comparam favoravelmente a um hotel, com um usuário Hostelworld dizendo que é" como um bom hotel por viajantes universitários', enquanto outro diz que se sente como "um bom hotel para o preço de um albergue. Este espaçoso e moderno hostel de estilo boutique é "confortável, limpo e bonito" de acordo com os nossos clientes. Há um bar no local e café, bem como "excelente" a segurança keycard. The Generator Hostel - one of Europe's best loved and most award-winning hostel brands - arrived in Dublin in 2011 and hasn't looked back since! 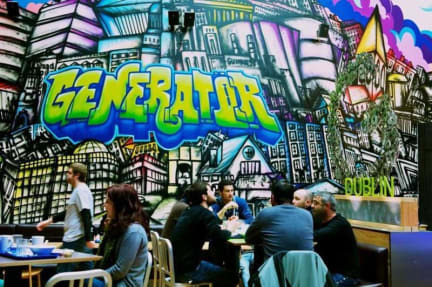 The Generator is Dublin's newest and most exciting hostel which offers state-of-the-art facilities, quality rooms, a central location, a fun atmosphere and much more - for the right price! We have tons of free stuff for our guests, including free bed linen, free towels in the single and twin rooms, a walking tour, lockers in the dorm rooms (remember to bring your own lock!) and Wi-Fi! There's free events happening every night, with drinks promotions and specials, karaoke, DJs, quizzes, pool competitions, drinking games, madcap monthly theme parties and more. Don't forget our regular movie nights in our in-house cinema room! We're a 24hr hostel which means there's laundry facilities, reception, a lounge and games room, pool tables, TV and great-value snack and drinks available all day and night. Photo ID required for Check-In. Our fun and friendly staff are on hand 24hrs to give you advice and recommendations on where to go and to point you in the direction of all of Dublin's hotspots and hidden gems. We're within short walking distance of some of the city's most popular visitor attractions including the Guinness Storehouse, Dublin Castle, The Wax Museum Plus and Jameson Distillery (so close - its right next door). For those interested in Dublin's exciting nightlife scene, the famous Temple Bar district is within 10 minutes' walking distance from our hostel, where you will find some of the city's best nightclubs, bars and restaurants. With handy transport links on your doorstep at the Generator, you're in easy reach of everything that the city and the rest of Ireland has to offer. Foi minha primeira experiência em um hostel e fiquei muito satisfeita. Eu e um amigo pegamos um quarto com 6 camas e foi ótimo! Banheiro dentro do quarto, boa limpeza, lockers grandes. Você consegue visitar os principais pontos turísticos de Dublin a pé. Recomendo bastante esse hostel.